Angry at life. Angry at the people around me. Angry at God. Angry at the things I can not control. That is a whole lot of anger building up inside me. I'm not sure what to do with it, but I have been spending a lot of time thinking about Psalm 4. What does that look like? I'm not sure anymore, but I want to know. I understand this one, but I am a little scared to do it. Scared to spend time alone with my heart, and be still. Scared of what I might find. Scared of what I might not find. It seems that anger and fear fit well together. I just wish they would fit well somewhere else, and leave me in peace. Oh, Tracie. I'm sorry you're feeling angry. That is quite a lot of anger for one person to carry around. I don't tend to deal with anger and fear very well. I have a hard time recognizing it. But when I do, I pray and meditate on it. 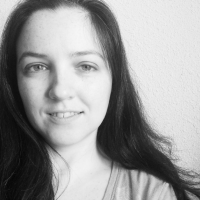 I try to examine what has me so worked up. What do I fear? Why am I angry? What can I do to change that? Is it a healthy anger? Is it a productive anger? If not, what can I do to change that or to change the way I think about it? I talk to a friend about it, which usually helps the most. I think identifying the root of the anger or fear is an important step for sure. Talking about it is always a good idea, too. I find that anger did more damage to me then the person I was angry at. Yes. This is so very true! For me, anger needs physical release. I pound on the bed, scream into a pillow, throw rocks into the lake, and take long, physically demanding walks. It's too easy for me to turn my anger against myself, so I need to get it out. Free-style writing also helps. I just keep my fingers typing, even if it's nonsense for a while, until it's all gone or I'm too exhausted to continue. I don't read or edit or question it. It's a way of helping me figure out what is going on inside. I know that anger. It's hard, it's demanding, and it's terrifying. But you're strong and you'll pull through to the other side. Hang in there. I like those ideas to get the anger out physically without hurting yourself or anyone else. Free-style writing is such a great thing. I do it in my morning pages, but it wouldn't hurt to do some of it focused around some of these issues. Oh man... that verse. 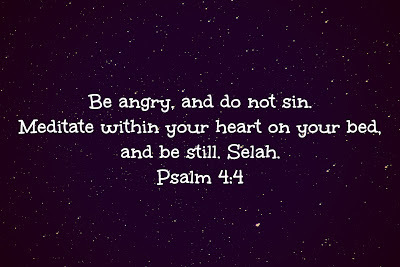 Saying its OK to be angry - but still, dont sin. I struggle so bad with anger. I FLIP OUT.. not pretty, when angry. I need to reign it in. & its something I'm currently working on & praying a lot about. Right? It is such a tough verse! Prayer. That is the biggest thing. I'm doing it - but I probably need to be doing MORE of it! "my anger is generally a response to one of two things: either pain or fear." Boom! This is exactly what I'm dealing with. Some pain and some fear. Faith has been tough lately. But I have it. And thinking about it in this instance leads me to the another verse that hops around in my mind - from Mark 9:24 "I do believe; help me overcome my unbelief!" There is a lot of faith in that. Anger is one of my most disturbing symptoms. I often take it out on myself in the form of self-harm which is obviously unhealthy. I keep busy. I get out and pound my feet on the pavement. I clean like mad (no pun) and I actually seclude myself from others (which also may not be healthy but it keeps me from unleashing the fury) or and Pinterest...check out the humor section. It'll make you laugh. I am going to spend some time in Pinterest's humor section. Laughing is good, and I need to intentionally seek it out. Thanks for that reminder. I usually take it out on myself in a lot of emotional and mental self-harm. Which is not as dangerous, but still quite unhealhty. Keeping busy is good. I need to find a balance between throwing myself into so many things I don't have time to think and shutting myself away from everything. It is an awful feeling to be consumed by anger. I tend to sad more than angry but either way you need to figure out the root cause of those feelings and deal with that or you will be doomed to constantly relive it. In the mean time you need some coping skills to apply. Like Kimberly, I work out my frustrations by cleaning like a crazy lady. My house never looks better. And talking - getting out is a fantastic way to release those negative feelings before you explode. Another thing that works for me is to ask myself will this matter in a year or more from now. Sorry about the babble. Hang in there Tracy. It will be better. I like that question - will this matter in a year or more from now? That immediately puts things into perspective. it is the fear that makes me angry at times. Once I have found my answer the anger leaves. I also learned to tell people around me that "I am feeling ... and need my space. Cross it at your own risk" more or less. You are in a difficult place and I know when I had three small children, raising them on my own, there was plenty of things that "made me angry" then some really special teachers came into my life and said "no one can make you angry, that I chose that in the space of my fear of failing" Big hugs and thank you for sharing. These are the timeless lessons of life. It is a good thing to be able to tell people around you that you need space. I like what you said about no one being able to make you angry. I'm going to have to think on that more for sure. Big hugs to you! 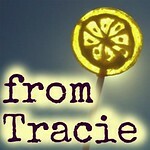 Tracie, I can really relate to you here. I become fearful of facing things that make me angry or upset so I ignore them instead. I usually push things back and try not to confront in hopes that the issue will go away - but they never do. I know now though that it isn't healthy to hold things in, so hopefully you can find a way to deal with your anger. That ignoring thing never works. Even thought I know that, I still try it far too often. Holding things in is definitely bad. 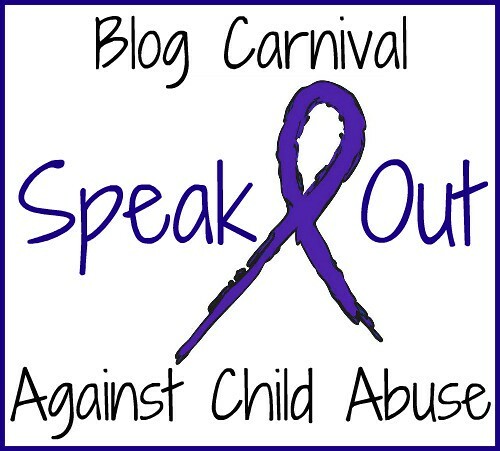 Just writing about this on the blog helped me to deal with it a little. Baby steps. Thanks! That's a tough space to be in. Who wants to be still when they are angry and fearful. Yet, that's often what we need to do. I hope you find peace soon! Yes. It is striking how often the thing we do not want to do is often the very thing we NEED to do! I can completely relate to this. The part that struck a chord with me was being still with my thoughts. It's why I don't sleep. The nights are the worst for me. My mind races. No advice really, just wanted you to know you aren't alone. Visiting from Pour Your Heart Out. Sleep. I spent a lot of years avoiding it as much as possible. These days I find it comes easier, but only because I wake up at 5am, and by 11 or 12 I am too exhausted to do anything but sleep. I'm sorry that you can relate to this, but I appreciate so much your reminder that I am not alone. That is huge. I'm so sorry you are feeling this way. I've gone through angry stages. I've railed at God- He knows how I feel anyway, so I might as well talk to Him about it. That seemed to help me. So true! I'm working on talking to Him about it. And I know that will be a big part of working through this. I'm sorry you're feeling this way too but I can so relate. Anger is one of my weak points. I give into my anger more than I would like. Anger and fear do seem to go hand-in-hand, don't they? I hadn't thought about that before. 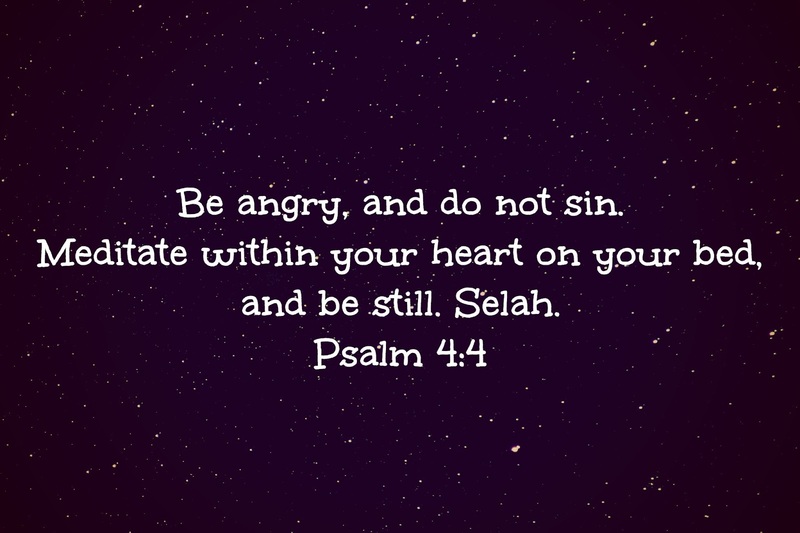 But Psalm 4 - be angry and do not sin? That's really powerful. I'm sorry you can relate - but there is comfort in knowing we are not along in this journey. Not being alone is a big thing. And writing always helps me. I was actually surprised at how much response (and amazing responses!) this post got. It is easy to forget how many of us are dealing with tough stuff. HI Tracie...I can totally relate to this. I used to be incredibly angry....not so much anymore. But I remember walking around angry at the world and not knowing how to deal with that anger. I ended up taking it out on myself, cutting and eating disorder and drugs. NOw I'll write or go for a hike or run. And I've learned something about anger...it's not bad to be angry and the unfairness of life but I am responsible for how I release it. Wishing you an absolute beautiful thursday.....thanks for being so honest and open. "It's not bad to be angry and the unfairness of life but I am responsible for how I release it." I believe this is a big key to the understanding of that verse. Your response, what you do with the anger, that is where you have to be careful.